South Canterbury New Zealand is blessed with fabulous snow capped mountains at our back door. 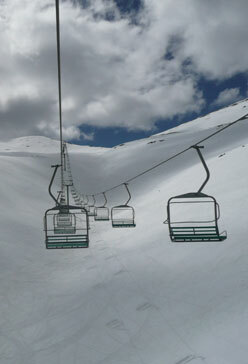 The Central South Island skiing offers ski and snowboard enthusiasts a great variety of commercial or club fields. Commercial fields offer snowmaking, state of the art snow grooming, cafés, gear rental facilities and more. Club fields are often less crowded, generally cheaper but offer fewer facilities. With three commercial and one club ski field offering top-quality facilities within an easy drive, skiing is a winter sport enjoyed by many locals. The ski season typically runs from mid June to mid October and increasingly, many visitors choose to base themselves in South Canterbury while enjoying a choice of fields to ski. On days when conditions are less than perfect on the slopes, there are plenty of activities to be enjoyed further down country. Enjoy a South Canterbury weekend before or after your ski trip is a fantastic way to experience the best the region can offer - take a few days to explore the South Canterbury NZ Food and Wine Trail or relax at one of South Canterbury's character bed and breakfast, lodge or farmstay properties. Mt Hutt is in the heart of the Southern Alps and just a couple of hours relaxed drive through the region’s farmland inland towards neighbouring Mid Canterbury. At over 2,000 metres, Mt Hutt has one of the largest vertical drops in the South Island and the greatest variety of terrain. Views from the top of Mt Hutt are breathtaking - across the Canterbury Plains out to the Pacific Ocean in one direction and into the heart of the Southern Alps in the other. A well developed trail network suits all snow lovers, from the total beginner through to the world's top pro racers and riders. Children from ages 3 to 17 are supervised in a variety of programmes. Just over an hour's drive from Christchurch International Airport, Mt Hutt is easily accessible from anywhere in Australasia. Fox Peak is South Canterbury’s only non-profit ski club, open weekends or at other times for organised groups. The 500-hectare fields, on South Canterbury’s giant Two Thumb range, are well known for their friendliness, mountain accommodation, wide-open spaces and huge runs for all levels of skier or ski boarder. Enjoy a great ski away from the crowds. Roundhill at Tekapo is fortunate in its location in the heart of the Southern Alps of New Zealand to enjoy plenty of cold temperatures and regular precipitation. The field offers a diverse mix of terrain – trails for the absolute beginner to trails that thrill the experts. All new in 2010 is the Heritage Express Rope Tow, 1440m long with 632m vertical rise and a top elevation of 2133m, giving access to the awesome steeps, chutes and big wide open places of The Two Thumb Range. 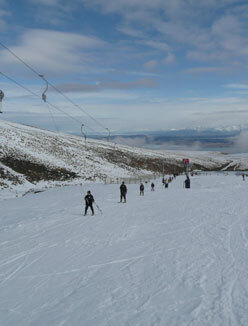 Mount Dobson, New Zealand’s highest ski field, is known for its relaxed atmosphere. Just a 40-minute drive from Timaru or a 3 hour drive from the centre of Christchurch to the base facilities, Mt Dobson has been owned and operated by a local family for the past 25 years. A friendly, relaxed ski field, Mt Dobson has an excellent mix of terrain with spacious learners' facilities and trails that will challenge all skiing and snowboarding abilities. For New Zealand skiing options, talk to the team at one of our Visitor Centres for more information, maps, directions and daily ski weather reports.